If you love Amy and her books…vote for Indebted in the Opening Round of The Goodreads Awards 2012 Best Author and Young Adult Science Fiction and Fantasy You can write your vote in! Hi Amy, thank you so much for taking the time to do this interview for all your fans, myself included! And thank you for putting up with my stalker-like tendencies but it’s been truly wonderful to be able to interact with you on your FB page, not to mention interacting with all your FABULOUS fans!! When did you discover that you enjoy writing and when did you realize that you wanted to make it a career? Amy | When I first began writing Inescapable, I didn’t have any “be a writer” aspirations. I began writing it to see if I was capable of writing a story and then actually LIKING what I wrote. It was an experiment. I wrote with the thought in mind that I’d never show it to anyone. It was just for me—the book I wanted to read. Did you know that you wanted to write YA Paranormal Romance? Amy | I did; I’ve always beencaptivated by fairy tales, folklore, and supernatural stories—stories that have taken me to other worlds where anything is possible. I love books that allow me to escape and get lost in completely unpredictable situations where the rules of everyday life no longer apply. I wanted to create a place that had the feeling of reality but rode the jagged-edge between that and fantasy. I was immediately drawn to the book based on the short synopsis and clearly I love every word in the series! I absolutely have to know how did you give birth to Inescapable, the many characters, the plot, etc..? Amy | First of all, let me just explain my writing style for a second. I’m what most people in the industry refer to as a “Pantser.” There are “Plotters” and there are “Pantsers.” Plotters meticulously plot out the outline to their stories chapter by chapter or plot point by plot point and adhere to them. Pantsers, on the other hand, start with maybe an idea of what will happen and then they write something completely different. I’m definitely a Pantser. No question. I began with just a rough idea for Inescapable. The main character would be a female beginning her freshman year of college. She’d be a unique being: one that was half-human and half-angel. She’d meet an angel, Reed, who would be torn between killing her and protecting her. Fallen angels would come and try to hurt her and Reed would protect her. The End. But…that’s not exactly what happened, is it? When I first started, I never conceived of a character named Russell; he just showed up in chapter three and started talking to Evie on the walk to Arden Lake. Chapter three was a game changer. I had been listening to Coldplay’s Reign of Love over and over; I couldn’t stop (which starts at 3:57 after Lover’s In Japan). That’s when I thought about what Russell actually could be. He could be Evie’s human soul mate: a soul that she has traveled through eternity with in many lifetimes; a soul that, because they’re so similar, his is like the other half of her own; a soul that won’t stop searching for his match no matter what comes. But now, in this lifetime, Evie is not just human, she is also half-angel. What if she is meant to be with an eternal love, one that is immortal because she is now immortal? What if Reed has been waiting for her since the beginning of time? That would be quite a love triangle, huh? So you can imagine, the first chapter of Inescapable started out completely different in the original version. I rewrote the first chapter after I wrote the last chapter of Inescapable to fit the storyline. It was easy to write the premonition that foreshadowed the ending after said ending was already written. Buns and Brownie showed up in chapter five. They were written into the story because I began to really love Evie and I wanted to give her a gift, so I gave her two of my best friends from college. They were wholly intended to be just sophomores when I wrote them, so I was a little surprised at the end when they were more than that. Freddie was written in the beginning to solely be Evie’s best friend. That changed too and I think it was when I was writing chapter thirteen that I thought Freddie could actually be more than he seemed, and not her best friend at all. That worked out because other than chapter two, Freddie is never around when Reed is around. That’s important to the storyline. Zephyr was just going to be a sort of flat character who didn’t do much after chapter eighteen. I had thought that once Evie convinced Zephyr not to kill her he’d go back to his life…but I couldn’t let him fade away. I started to really love Zee. There are so many possibilities to explore with him. He makes me laugh, so I’m keeping him. Did you know right away that you wanted to make this a series? Amy | When I started, I didn’t think that I could write one book, let alone two. As I said before, Inescapable was an experiment to see if I could do it. Once I finished Inescapable, I was sure it was a fluke. That scared me because writing had become an exquisite escape for me. I didn’t want that to end. I started writing Intuition right away because I thought I was going to run out of things to write about if I didn’t. As it turns out, the reality is that I can’t stop writing. It’s an addiction, a compulsion—a need. I read like that, too. It doesn’t matter if it’s four o’clock in the morning, if the book is good; I’m going to keep reading. I wrote chapter six of Intuition first; it’s the first chapter from Russell’s first-person point-of-view. After I finished that chapter, I realized that beginning with Russell wasn’t where the story should start, so then I wrote the first five chapters in Evie’s first-person point-of-view to develop Reed because I felt like we hardly knew him. I wanted to know what he was thinking and how he felt about all this…and he showed me. I love when Reed speaks. He’s the most mysterious character I have in that he doesn’t “talk” a lot, but when he does, I hang on his every word. I have to ask about my beautiful Brennus but one of the MANY things I love about him is his Irish accent. Did you have to do research on the accent in order to channel it or did it just naturally flow on paper? Not that I want to ask about Russell *heavy sigh* but did you have to research his accent as well or not? Amy | I lived in Myrtle Beach, South Carolina for a few summers while I was in college. I was a lifeguard on the beach in Cherry Grove. I didn’t get the accent quite right at first and I had to do a revision to fix it. I have since softened Russell’s accent in Indebted and I have really lightened up on it in Incendiary. The feedback I was getting from readers told me that the accent was distracting; I’ve altered it to make it less so. All the characters that you created are so rich and real, did you fall in love with them as much as we did or are you fond of just a few? We (your fans) talk about these characters as if they’re real people and there’s no shame in our game but do you do the same? Amy | Oh, wow, yes. I love them all. I sometimes forget that a few of them are supposed to be evil, especially Brennus. It’s a little weird because when I’m writing, I hear their voices in my head and the stories play like movies for me. Some scenes are really hard to write because I have to live for days in an underground cell with Evie in Houghton or in an evil church with Russell and Brownie being tortured. When I was halfway through Inescapable, I had planned on killing Russell at the end. That would’ve been perfect, right? Then Evie wouldn’t have to choose because Reed would be the only one left. The problem was that, when I came to the end, I couldn’t do it—I couldn’t kill him then and I’m glad I couldn’t. There is too much story left to tell and he’s a major part of that story. With your fans, there is no “in between” when it comes to Reed, Russell and Brennus. We love one of them and we are totally committed!! How do you feel about all the trash-talkin’ that takes place on your FB page when we openly declare our love for the person who should be with Evie?? Amy | I was wide-eyed when I first witnessed the devotion that readers have for these characters. Candace went a long way in destroying Russell as a “team leader,” I think. The trash talking about him is understandable in some instances, but it sometimes makes me feel like I didn’t do him justice in my writing in order to make you love him like I love him. For the most part, though, I think it’s funny. I think, like Evie, I’m torn between them all. I love each one for different reasons so I cheer for each in his turn. I’m still the most surprised by the reaction to Brennus. He’s very seductive and mercurial, but I didn’t know just how much he would resonate with readers. He has his own followers. It’s a bit shocking. If you could cast the role of Evie, who would you cast? What about Brennus (please say David Gandy), Reed and Russell?? Crestwood College is named after your neighborhood and Buns and Brownie are characters based on real people but is there anything else from the series that’s based on places or people who you know besides what’s been mentioned? Amy | My best friend in the world growing up is named Molly. She is the inspiration for the character of the same name in Indebted. They’re not much alike, though, because I had to make her character a little evil and the real Molly is not at all. Some of the events in Inescapable are similar to my real life. I based Crestwood College on Hillsdale College, my alma mater. Every year at Hillsdale the freshman class goes for a walk to Lake Baw Beese after orientation and has a barbeque. Sound familiar? We had “wars” with the Delts and liberated their composite. There was really a freshman directory that was often used to rate freshman girls. I had an art professor who was an artist and he taught my art history class. There’s more, but I doubt you have time! What can your readers expect from Incendiary and do you know when it will be available for pre-order? Amy | The war to possess Evie dominates the storyline of Incendiary. You know of two factions in that war, but there is a third that you have yet to meet. This story is fast-paced and driven by action. It may leave the reader feeling like she ran a marathon by the end. Unfortunately, I’m an independent publisher, which means that Amazon and the like don’t make pre-ordering available for my work; they only do that for the major publishing houses. The great thing, though, is that my books are printed on demand so they never sell out. Iniquity is the 5th book in the series, when do you plan on releasing that and will that be the final one? I think I just got choked-up asking that question! Amy | I have to write Iniquity; it’s not finished, yet. I have no estimated release date. I think that Iniquity will be the last book in the Premonition Series…maybe. I’m trying to find the ending where I can say, “Ahhhh, that’s it, that’s the end.” I’ll know it when it comes, and then that will be it. Remember, I’m a Pantser, right? What can your readers expect from you in the future? I’m dying to know but what can you tell us about Kricket? Amy | Kricket is a working title for a manuscript I wrote in 2010. I wrote it in tandem with Incendiary. I’d write a couple of chapters of Incendiary, and then toggle over to Kricket and write a few chapters of it. I did that because I was afraid that after writing three Premonition Series books the storyline would get stale if I didn’t mix it up. I had also been interested at the time in trying to find an agent to represent my work, so I wrote it with word count in mind. It’s only 90K, which is 50K less than Inescapable. Essentially, Kricket is a dystopian novel with sci-fi and supernatural elements intended for the young adult market. Seventeen-year-old Kricket Hollowell’s only wish is to find a home where she belongs. An expert at dodging the Chicago Department of Social Services caseworkers who want to force her back into foster care, Kricket is unprepared to avoid Trey and Kyon, soldiers from opposing factions sent from another world to remand her back to their own. Desperate to avoid capture and remain in the city, Kricket trades one cultural prison for another when Trey takes her beyond this reality to an entirely new one. With her uncanny ability to discern truth from lies, Kricket will need every instinct, all her street sense, and the gifts that she has inherited from her priestess mother in order to avoid being controlled and sold to the highest bidder. And…she’ll need Trey. The thing I really love about this character, Kricket, is that she’s not like Evie. She’s completely ready to smack the taste out of your mouth if you back her into a corner, so she’s fun to write. I have written one book in this series and I plan to make this a trilogy. I intend to publish the first book in 2013. I know in July 2012 readers had the opportunity to meet you but for those of us who missed that event, will there be another in the near future? Amy | My next book signing is the Indie Chicks Book Tour. It will be held at the Jones Creek Road Regional Branch in Baton Rouge, Louisiana on November 15, 2012 at 4:00p.m. The featured authors are: Georgia Cates, Shelly Crane, Rachel Higginson, M. Leighton, Monique O’Connor James and me! Cristina | No, thank you Amy!!! You truly are AUH-MAZING!!!! Fantastic questions Cristina! This is my favorite Amy interview that I’ve seen so far! Can’t wait for Incendiary to be released! Hi and thank you!!! I’m so glad you liked it because I certainly had a fabulous time putting it together and Amy is BRILLIANT!!! 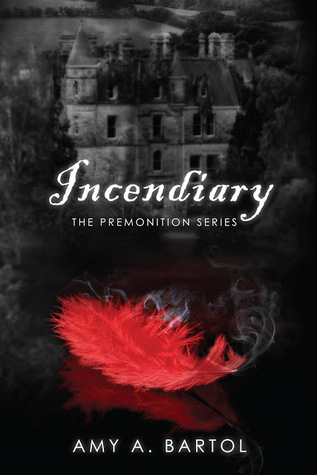 I’m going to do a special giveaway for the release of Incendiary but don’t tell! I had one before, but this interview has just intensified my author crush on Amy Bartol. I am so torn between Team Reed and Team Brennus, it’s not even funny. I know I shouldn’t love Brennus, but c’mon… He is pretty effing awesome! Awesome interview and I am SO looking forward to Incendiary. Thanks for sharing! I love Amy Bartol! She’s truly amazing and I love her books a lot! Like A LOT! I can’t to read this book! Book 5, Book 5, Book 5….did I say Book 5? oh, and one more thing…I actually looked up the pictures of all of her characters she “cast.” I always “cast” my own. I actually had Ian Somerhalder as Brennis in my mind, but I like her idea even better! I too had Blake Lively as Buns! But I do not like her choices for Brownie or Evie. interesting…Liv Tyler maybe. Reed always seemed like he must be smoldering handsome because I found his character to be the most boring. He’s not funny or charming, so what’s left? I thought Russell was supposed to be a big jock like handsome devil. I cast my old boyfriend from the south for that one (wink)… handsome in a rugged way and always has a twinkle in his eye.